"DeKalb County Animal Services announces SNIP DeKalb, which provides free spay/neuters, including vaccinations, for low income pet owners that reside in DeKalb County. 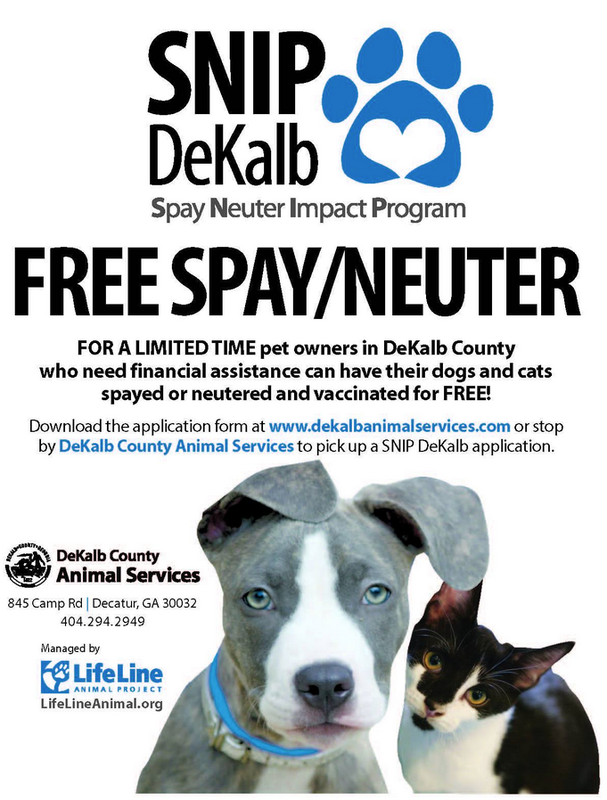 DeKalb Residents who can not afford to pay for a spay or neuter themselves at one of the low cost spay/neuter clinics should print and fill out the SNIP DeKalb application and send it in. When approved, a voucher for the free spay/neuter and instructions will be mailed to them." See the application form for no-cost spay/neuter and also their page on low-cost spay/neuter. And don't forget the shelter has extended their "Home for the Pawlidays" very reduced adoption fees ($20 for dogs, $10 for cats) through January 15!